Isn’t machine learning (ML) and Artificial Intelligence (AI) the same thing? Nope. And this piece, Machine Learning Vs. 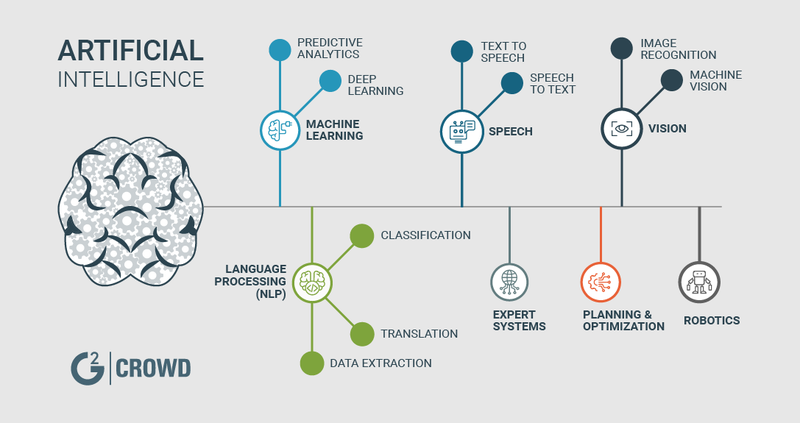 Artificial Intelligence: How Are They Different?, does a nice job of reviewing them at a non-technical level. At the end, you should see the differences. (The image, via g2crowd.com, also shows this nicely). What makes this development significant to me is that it signals that Sonos is concerned with Apple and others coming and taking away market share. Sonos has a great line of products already, but Apple is threatening to take a piece of that with their new home speaker with Siri/AI capability. Sonos has beefed up their AI capability to meet the challenge. I expect that the next big thing in IT will be the vocal interface tied in with a speaker system in some form. I expect we will see them everywhere. Perhaps not for extended communication, but for brief and frequent requests. If you are an IT person, I recommend you learn more about chatbot technology and how it will integrate with the work you are doing. More and more users will want to be able to communicate with your systems using voice. You need to provide a vocal interface for them to get information and send information. Most homes will have one device acting as an aural hub. Sonos wants to make sure it is one they make, and not Apple. This piece: What it’s like to be a modern engraver, the most automated job in the United States — Quartz, reminded me once again that the best use of technology is to augment the people doing the work, and not simply take away the work. Must reading for anyone who’s believes that the best way to use AI and other advanced tech is to eliminate jobs. My believe is that the best way to use AI and other advanced tech is to make jobs better, both for the employee, the employer, and the customer. The businesses that will succeed will have that belief as well.